Product Code: MH-BRACKET Brackets will be different based on compatibility of machine manufacturer, hoop size and sewing field. One extra set of brackets for use with your existing Mighty Hoop. 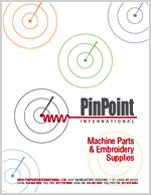 This item is for customers that have more then 1 brand of embroidery machine. Mighty hoops come with 1 set of brackets, this item is for another bracket set to adapt the Mighty Hoop to an additional brand of machine. The brackets will only fit one size of Mighty Hoop, so be sure to select the correct Mighty Hoop size, Machine Manufacturer and Sewing Field of the additional machine from the drop down menu. There will be a charge for exchanging hoop brackets if you enter an incorrect sewing field size for your machine. The Bracket image does not represent all brackets provided for machine brand or hoop. Your brackets may be different based on machine manufacturer, hoop size and sewing field.